Giuseppe Giusti L'ampollina di Anna Aged Balsamic Vinegar...Giusti L'ampollina di Anna balsamic is produced from a special reserve selection from the ancient barrels of the Giusti Acetia. Once mature, L'ampollina di Anna is finished with the addition of a generous amount of extra old Guisti Balsamic. With a careful balance of sweet & tart, the well-defined Giusti bouquet, L'ampollina di Anna exemplifies the unmistakable Giusti flavor characteristics. Giusti L'ampollina di Anna containing vinegar of great age is very dense, having a rich aroma, is both intense in flavor & consistency!!! 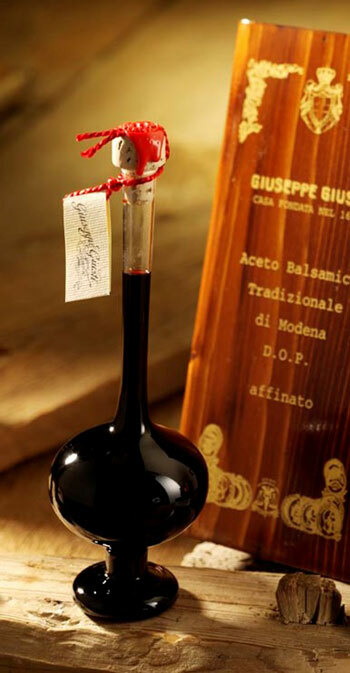 Giuseppe Giusti L'ampollina di Anna Balsamic Vinegar. A stunning Hand-blown venetian glass bottle, packed in a handsome solid wood-hinged box.